This 14K white gold engraved hearts smoky quartz ring is a chic celebration of love with a sophisticated, understated gemstone. 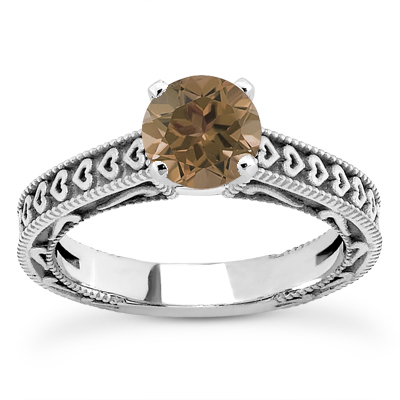 The 6.5mm round smoky quartz that glimmers as the focal point of this romantic ring provides grayish-brown sparkle that's always classy. A row of engraved hearts embellishes the outer surface of the 14K white gold band, while swirls are gracefully curved into the sides. Petite rows of milgrain frame these designs and provide this piece with an extra dose of elegance. 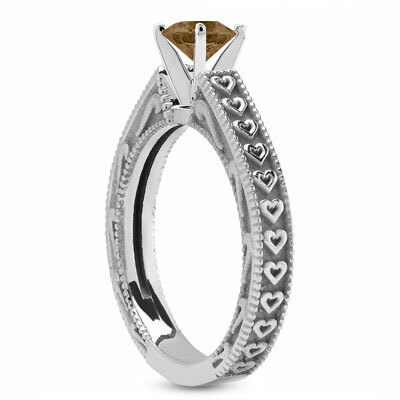 A 6mm smoky quartz is set in a 14K white gold setting with a heart design. We guarantee our Engraved Hearts Smoky Quartz Ring to be high quality, authentic jewelry, as described above.